Mobile users search mostly for local stuff. In addition to shorter search keyphrases, mobile searchers are also locally targeted. It is easy to understand – when a user is standing in the street and is looking for a place to dine, he or she is most likely looking for things in the neighborhood, not in another corner of the world. Searches like “pizza 5th Avenue” are quite popular, which makes local search results even more important to concentrate on. 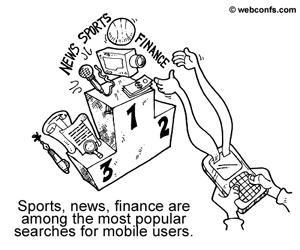 Sports results, news, weather, financial information are among the most popular mobile search categories. The main topics and niches mobile users prefer are kind of limited but again, they revolve around places to eat or shop in the area, sports results, news, weather conditions, market information, and other similar topics where timing and location are key. If your site is in one of these niches, then you really need to optimize it because if your site is not mobile-friendly chances are you are losing visitors. You could even consider having two separate versions of your site – one for desktop searchers and one for mobile searchers. Submit your site to major mobile search engines, mobile portals, and directories. It is great if your visitors come from Google and the other major search engines but if you want to get even more traffic, mobile search engines, mobile portals, and directories are even better. For now these mobile resources work great to bring mobile traffic, so don’t neglect them. Very often a mobile user doesn’t search with Google, but goes to a portal he or she knows. If your site is listed with this portal, the user will come directly to you from there, not from a search engine. The case with directories is similar – i.e. if you are optimizing the site of a pizza restaurant, then you should submit it to all directories where pizza restaurants and restaurants in general for your location are listed. Mobile search standards are kind of different and if you want your site to be spiderable, you need to comply with them. Check the guidelines of W3C to see what mobile standards are. Even if your site doesn’t comply with mobile standards, it will still be listed in search results but it will be transcoded by the search engine and the result could be pretty shocking to see. Transcoders convert sites to a mobile format but this is not done in a sophisticated manner and the output might be really unbelievable – and everything but mobile-friendly. Meta.txt is a special file, where you briefly describe the contents of your site and point the user agent to the most appropriate version for it. Search engine spiders directly index the meta.txt file (provided it is located in the root directory), so even if the rest of your site is not accessible, you will still be included in search results. Meta.txt is similar to robots.txt in desktop search but it also has some similarity with metatags because you can put content it it (as you do with the Description and Keywords metatags). The format of the meta.txt file is colon delimited (as is the format of robots.txt). Each field in the file has the following syntax form <fieldname>:<value>. 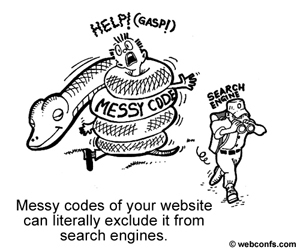 One of the advantages of meta.txt is that it is easily parsed by humans and search engines. 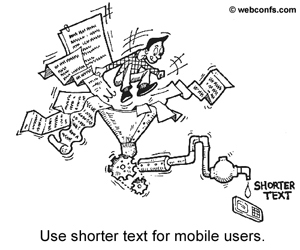 Use shorter texts because mobile users don’t have the time to read lengthy pages. We already mentioned that mobile searchers don’t like lengthy keyphrases. Well, they like lengthy pages even less! This is why, if you can make a special, shorter mobile version of your site, this would be great. Short pages don’t mean that you should skip your keywords, though. Keywords are really vital for mobile search, so don’t exclude them but don’t keyword stuff, either. Use phrases, which are common in predictive search. Predictive search is also popular with mobile searchers because it saves typing effort. This is why, if your keywords are among the common predictive search results, this seriously increases your chances to be found. It is true that predictive search keywords change from time to time and you can’t always follow them but you should at least give it a try. Always check how your site looks on a mobile device. With the plethora of devices and screen sizes it is not possible to check your site on absolutely every single device you can think of, but if you can check it at least on a couple of the most important ones, this is more than nothing. Even if you manage to get visitors from mobile search engines, if your site is shown distorted on a mobile screen, these visitors will run away. Transcoding is one reason why a site gets distorted, so it is really a good idea to make your site mobile-friendly instead of to rely on search engines to transcode it and make it a design nightmare in the process.